Morocco was named after the walled city of Marrakech, which is set on a flat plain between the snow-capped Atlas Mountains and the Sahara. The ramparts, 19km long and up to 9m high in places, completely encircle the medina, with magnificent gates at irregular intervals. Marrakech was originally a staging-post on the Spice Route, and the bustle of its souks reflects its thoroughly commercial soul. On the central town square, Jemaa el-Fna, a large market gives way at sunset to snake-charmers, jugglers, performing monkeys, henna-painters, professional storytellers and every variety of street food. The minaret of the huge Koutoubia mosque, built in 1147, appears to keep a watchful eye on all this human frivolity and frailty. 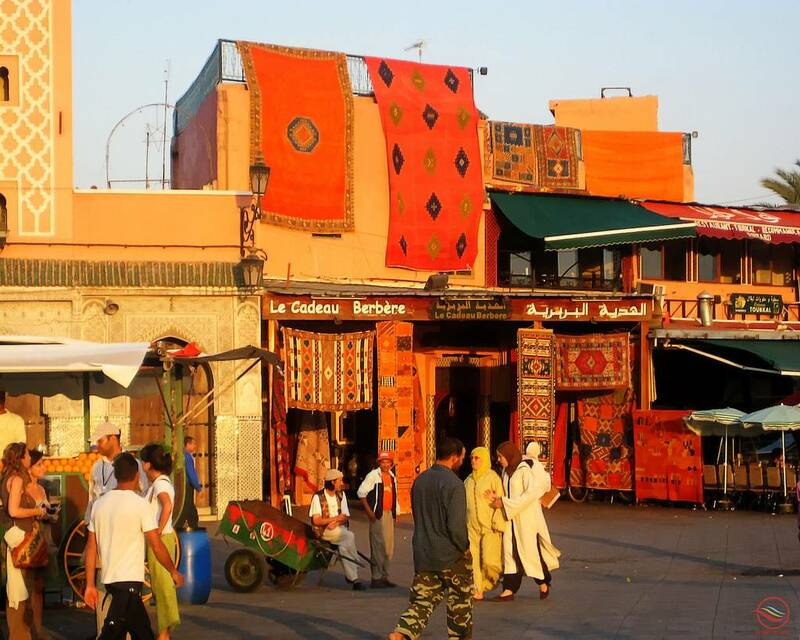 The main souk area is the the north, around Rue Souk el-Kebir, and here you will find all the usual suspects, metalwork, baskets, clothing and leather goods. Beautiful green refuges on the outskirts of the city such as the Menara, Aguedal and Majorelle gardens and La Palmeraie provide a tranquil counterpoint to the general bustle and hubbub. The 19th-century Palais Bahia, with its apartments, courtyards and gardens, gives a vivid impression of the luxurious life of a grand vizier. Opposite is another jewellers’ souk, and just to the south are the narrow streets of the Mellah, or Jewish quarter. The nearby Dar Si Saïd palace is now a museum with jewellery, pottery, carpet and clothing exhibits that provide a fascinating insight into the culture and craft of this imperial city. 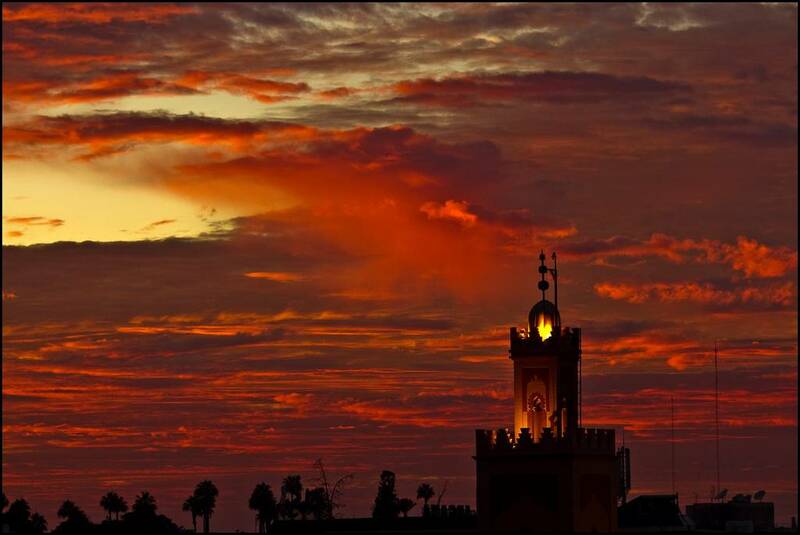 Marrakech has a subtropical climate and consequently the weather is dry and sunny all year round. However, temperatures in the summer months, and particularly August, can be very high. During the winter months, it is still warm during the day but can get cool in the evening. The monetary union of Morocco is the Dirham (MAD). 1 MAD = €0.10 approximately. Throughout the country it’s very difficult to cash traveler’s checks or use credit cards. Euros are the easiest foreign currency to exchange, and are often accepted as payment if you don’t have any dirhams to hand. The easiest and best way to get cash is from an ATM, which are located around the city. Arabic is the official language but French is widely spoken and used. Voltage Guide: 220V, 50Hz. Standard European two pin plugs. 110V can still be found in older buildings. Two pin plugs are commonly used. For UK and US citizens, a visa is not required when entering Morocco. Upon entry, visitors are eligible to stay in the country for up to three months. No vaccinations are required but most travellers generally take vaccinations for hepatitis A and typhoid. It is advisable to drink bottled water there. There’s no rule, but generally a tip of 10 to 15% is expected in the more expensive bars and restaurants. In taxis visitors can round up to the nearest 5 dirhams. Visitors should note that tips are the only income for some porters and guides so a 10 dirham tip would be appropriate. The best time of year to visit Marrakech is between September and May when the temperature is cooler than the hot summer months. However, July hosts the annual Marrakech Popular Arts Festival which can be particularly lively. 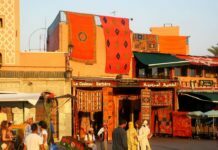 August may not be the best time to visit Marrakech due to the large influx of tourists there at that time and the hot, dry summer weather. Shopping hours at the souqs or markets are usually 9 am – 8 pm Monday to Saturday. Some close for lunch; some may close on Friday; some, remain open on Sunday and public holidays. Marrakech is one of those destinations that you can read about, hear about from friends and gaze at pictures of endlessly, but until you’ve actually been there you won’t come close to guessing what it’s like. We’ve picked out five things for you to do and see in order to start to comprehend this boggling, enchanting city. Djemaa el Fnaa Marrakech’s beating heart, one of the largest squares in the world and a UNESCO World Heritage Site, is most alive at sunset. Food vendors set up stalls, lighting barbeques that drift smoke across the square’s storytellers, dancers and drumming circles that draw crowds of locals and tourists alike. During the day, snake charmers, acrobats, musicians, monkey handlers, fortune tellers, healers and dentists ply their remarkable trades. Absolutely unmissable. Dating from the 16th century, these royal tombs are vastly impressive, with rich decorations, domed ceilings, ornate carvings and sun-drenched gardens. It’s no wonder that they’re one of Marrakech’s most popular sights. 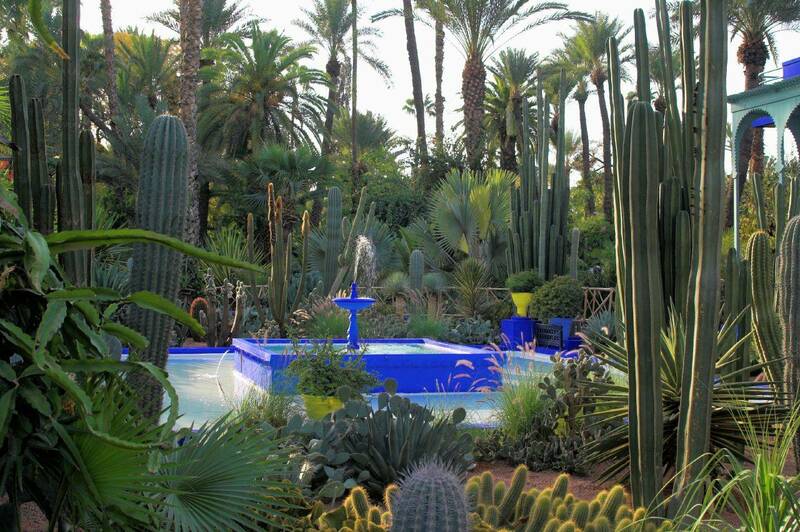 It’s rather a surprise that a city as dry as Marrakech is famed for its gardens. Ancient underground irrigation canals make it possible, and the hugely appreciative local population make it worthwhile. The best two are the Menara and Marjorelle gardens, although the gardens of Koutoubia mosque are easily accessible and great for non- Muslims, who aren’t allowed to enter the mosque itself. The souks of Marrakech’s medina spread out from Djemaa el Fnaa. Don’t worry about getting lost – someone will direct you back, although they may ask for a few Dirhams in return. Generally, the further from the square you venture, the better the price. Be prepared to haggle. If you’re after a particular item – carpets and leather goods are especially good buys – it might be worth hiring a guide to show you through the labyrinthine alleyways, which are another attraction in their own right. Whether you’re buying a carpet, watching the world go by in a cafe or slipping into a cool riad to escape the bustle of the souks, Morocco’s ubiquitous mint tea will make an appearance. The hot, sweet brew is traditionally poured from a silver teapot in a long swooping motion and is absolutely divine. The biggest mountain range in Africa, stretching from Morocco to northern Africa. Visitors can go biking, hiking or do magnificent sightseeing. The magical and mystical African desert. There are numerous excursions to both the Sahara and the Atlas’s.